Thanks to readers for the tip offs. Keep em’ coming if you have them. Run Dash Pullover in Wish Blue. Coming soon! This is from Australia so possibly next week or so we’ll be seeing this in the US and then in Canada. I’m loving the coral color in the bottom picture. Looks like it will also be available in Heathered Lilac, Heathered Teal Zeal and Heathered Black. I think I would get these in Teal Zeal and Lilac as they are the lighter more visible colors. I wore my Inspire Pullover the other night for a very dark run (hate night running) and I was thinking that I should have picked a more visible one. Although the static black is really pretty and looks great with every Cool Racerback I’ve worn under it. Especially my Pig Pink one. 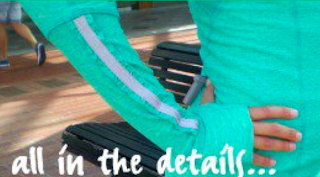 This Run Dash has some nice reflective strips on the arms and I think that’s my favourite placement for reflectivity. I wore my Brisk Arm Warmers the other night and I really liked how the reflectivity on the back of the arms were visible to drivers coming up behind me and also to the side. With swinging arm movement it’s hard to miss the reflective strips dancing around. Check out the ruffling along the reflective strip. Cute detail, hope it looks as cute in person. Dash through your winter workouts in this performance mid-layer! Cuffins with thumbholes for warm hands! "New Photos: Inspire Pullover, Power Dance Tank, Heart Tank"